Selection of Fruit and Vegetable peelers , an apPeeling product to promote your business. Great and useful kitchen utensil that will put you on the cutting edge and maintain your customer relationship always sharp. Cooking is part of everyday lifestyle thus the use of kitchen utensils is indispensable. 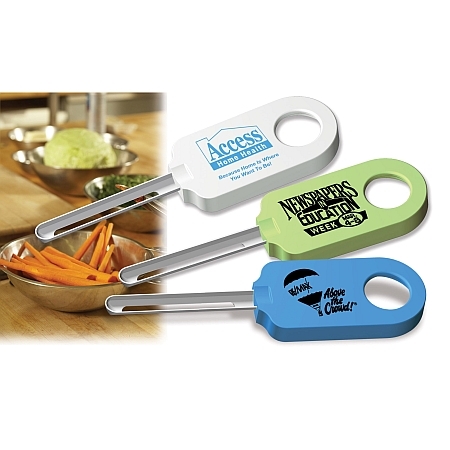 Your promotional message imprinted on these kitchen tools will remind the recipients of your services and company logo. Peelers are practical tools for fruits and vegetables, and these particular ones have a large imprint area for your logo to stand out. This promotional product is suitable for Real Estate companies, Cooking schools, Grocery stores, Food stores, Realtors as house warming gift, Magazines give away, Trade shows, and many more application. No Kitchen Should Be Without One of these Practical Promotional Vegetable Peelers. Vegetable Peeler Fits conveniently in any drawer; Stainless steel blade with double cutting edge makes for effortless peeling; Available in three, attractive, kitchen pleasing colors. Large imprint area for your logo and info. Size: 2 5/8" x 5 1/2" x 3/8"
Imprint Area: 3/4" x 1 1/4"